Quick Stats: Distance = 4 miles, Elevation Gain = 3,200 feet. 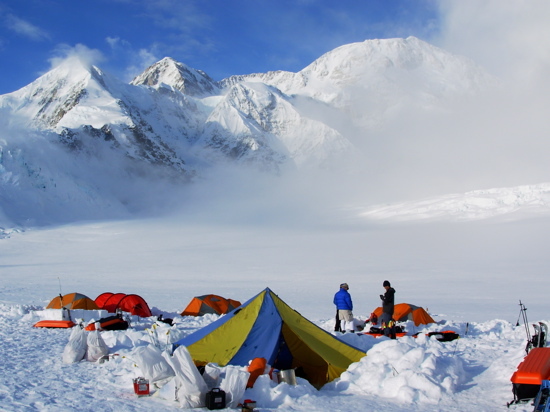 Time: approximate time from Camp 1 to Camp 2 = 9-12 hours. 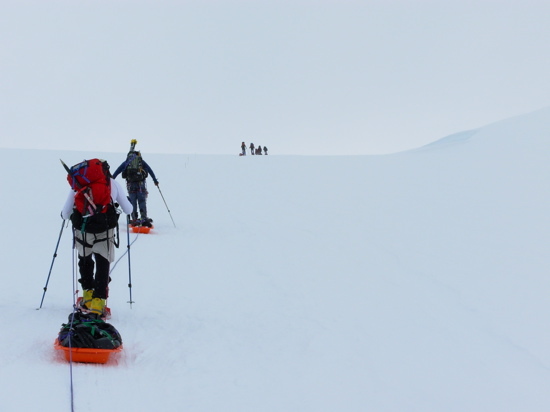 After reaching Camp 1, most groups go into a "double carry," or typical expedition-style of climbing. From Camp 1 we typically make a cache at 10,500 feet on one day and then move to Camp 2 on the next. 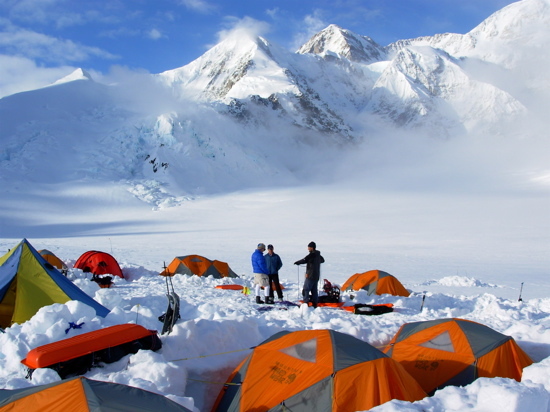 Depending on weather and how warm it is, teams may choose to be on a night schedule up to Camp 2 and even Camp 3. 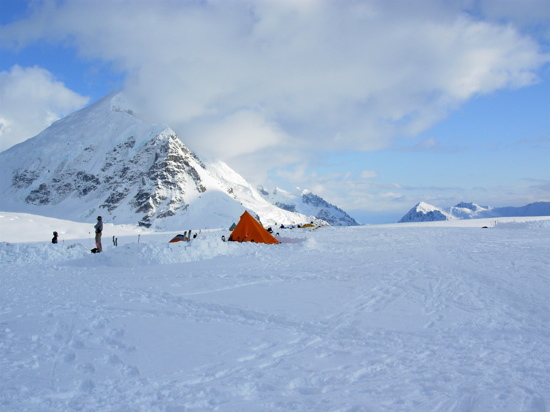 Camp 1 is where the approach for the West Buttress splits off from the route to the West Rib route. The West Rib route is approach via the Northeast Fork of the Kahiltna, also called the "Valley of Death." 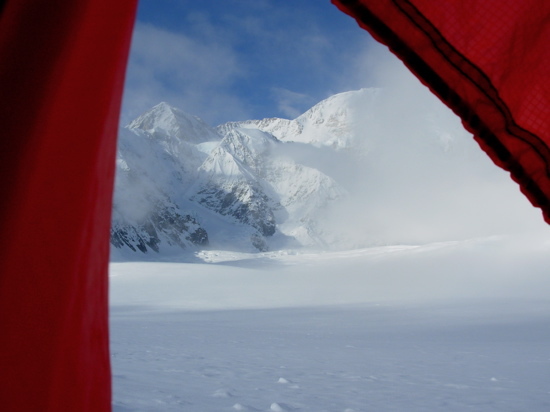 Hearing the thundering roar of immense avalanches up the Northeast Fork from Camp 1 is not uncommon. 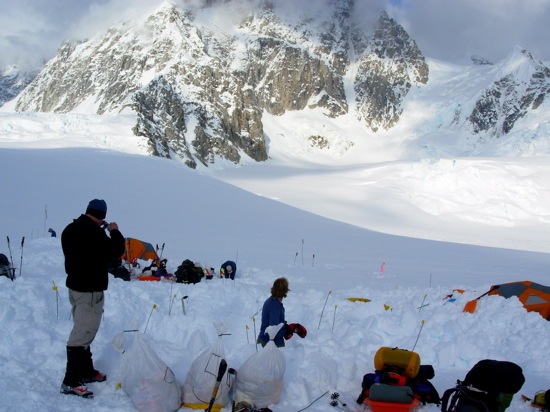 We will leave a cache of garbage and miscellaneous items at Camp 1 for retrieval on the descent. 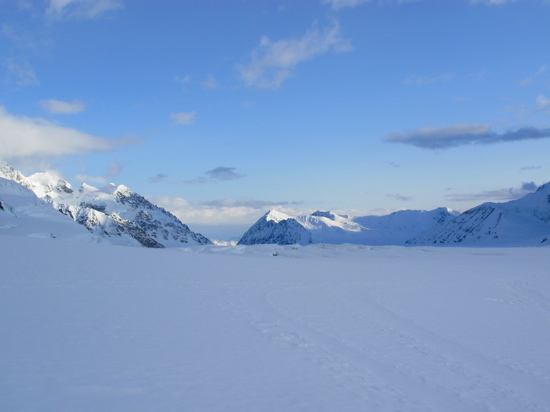 Looking at Camp 1 with the lower Kahiltna and Mount Frances behind. 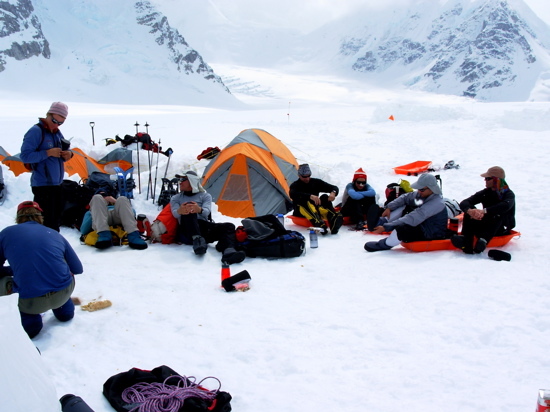 An AAI group gets settled into Camp 1 with the Kahiltna Peaks behind. 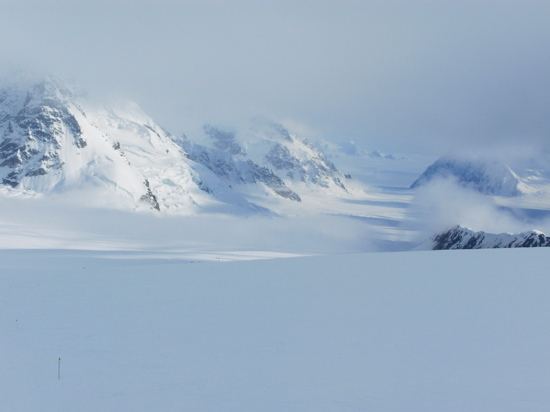 Looking back down the main branch of the Kahiltna Glacier. The sun sets on the Northwest Fork of the Kahiltna with Mount Frances and Mount Hunter in the distance. Enjoying some down-time at Camp 1. 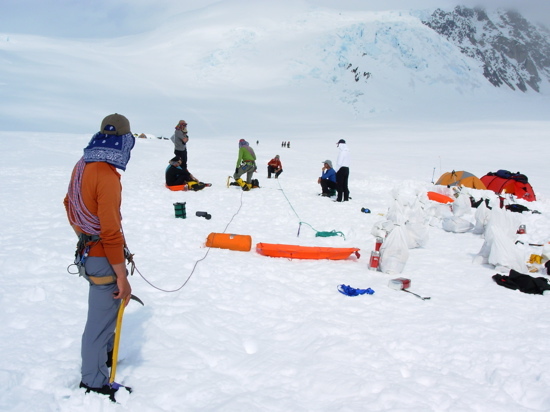 An AAI group practices crevasse rescue scenarios at Camp 1. 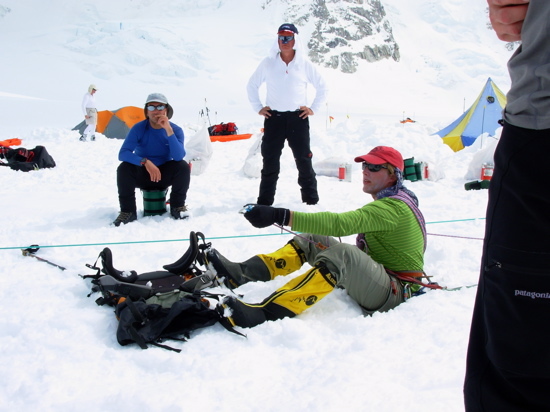 AAI Guide Erik Johnson demonstrates group crevasse rescue at Camp 1. 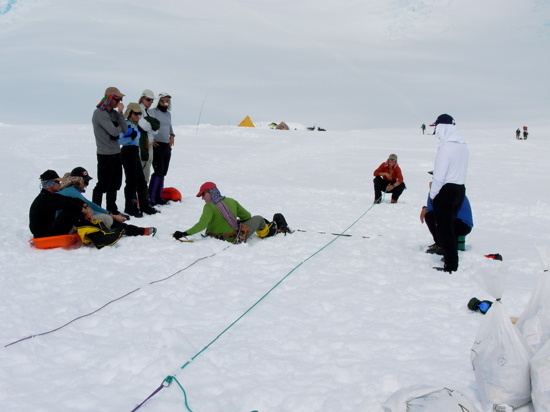 Climbers participate in a crevasse rescue demonstration. Looking up at the West Buttress Direct and Windy Corner from Camp 1. 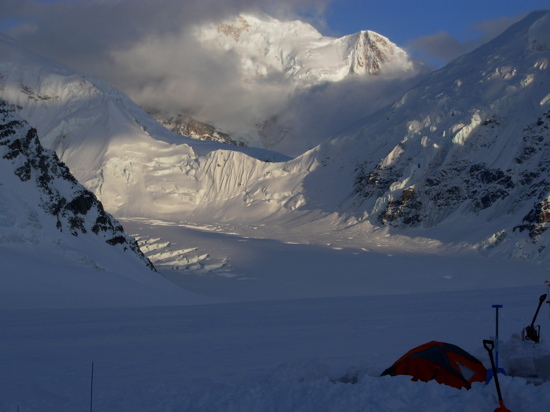 An AAI group at Camp 1 with the West Buttress Route in the distance. Killing time at Camp 1. 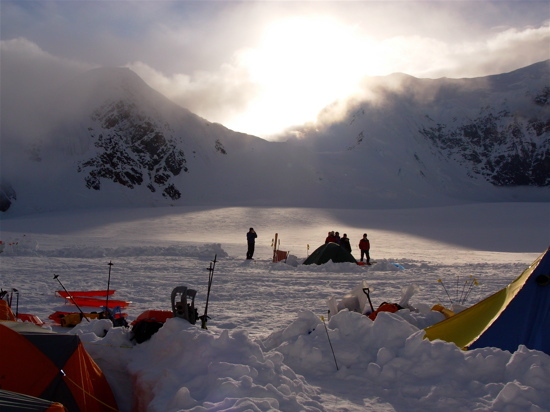 Late evening light at Camp 1. 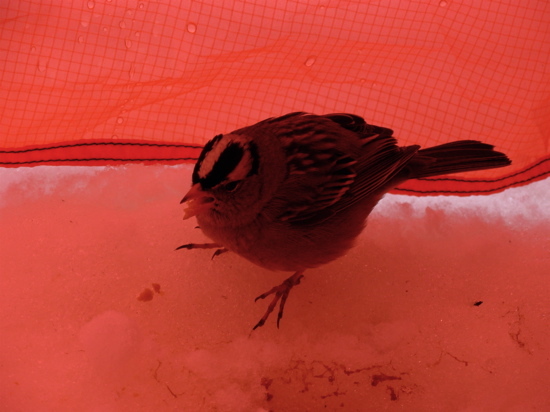 A tent visitor at Camp 1. Climbers start up Ski Hill above Camp 1.